Sublime Chocolate Wafers presented in a mix of flavors including milk chocolate, dark chocolate, white chocolate, raspberry and caramel. A malt-like crunchy ball coated in decadent chocolate. These Chocolate Wafers are part of Chocosina's Sublime Gourmet Collection. Gourmet collection cubes are required to be ordered in multiples of 3 units as the cost includes a 3pc and/or a 6pc gourmet gift box with shipping, and can be combined with other Gourmet collections. Gourmet Champagne flavored jells covered in vanilla white delicious seeds. As stunning as a moonlight walk in Paris! Gourmet Vintage Drops deliciously-made in Citrus, Raspberry and Violet flavors. A classic French Riviera delight! Gourmet Sublime Collection of caramel pebbles covered in dark chocolate with a variety of thin candy-colored shells. 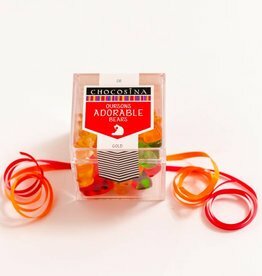 Gourmet Adorable Bears in a variety of elegant and natural flavored colors. These bears are representative of Germany! Gourmet Glamour Pearls shimmered in a candy coated milk chocolate delight. A site usually found in the Greek Islands and the Andalucian coast of Spain! Gourmet Chic Jewels in the form of pearlescent sheen jelly beans. As beautiful as the gems of the Mediterranean Sea!